Shop Rate is $110 Per Hour Worked. Due to the custom nature of many of our installations, Book time is not used for our jobs. This rate includes something that are commonly over looked such as... Unpackaging items, non installation parts assembly, product set up, phone calls and research for tech support problems. 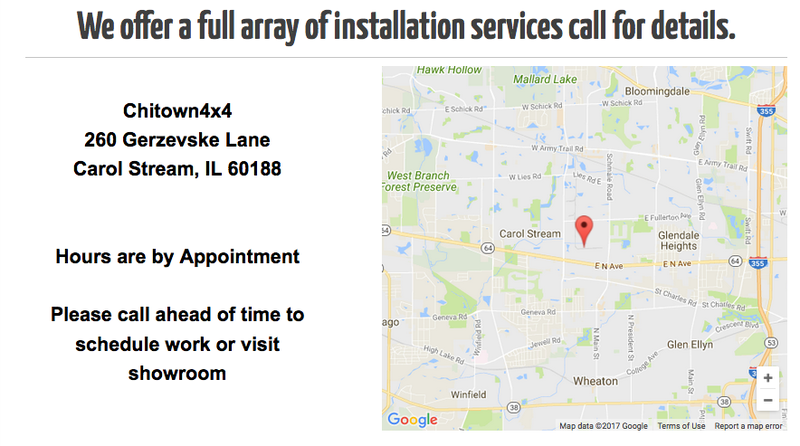 Travel times if needed for custom parts or unique installations. Items that need to be removed in order for other things to be installed, then put back. Slider installs are $150 , weld on sliders are more. U bolt style installs can also be more. XREAS Removal is $200, VHC Removal from land Cruiser is shop rate. Notes for installation basics: If your truck is rusty or has rusted bolts, you will be charged by the hour to repair and replace them. Also any of the jobs listed on this page won't apply to overly rusty vehicles. You will be charged the Hourly shop charge for us needing to work through the corrosion and lack of maintenance. New upper top hats frequently get fused to the coil bucket. new top hats are $20 to $45 per and labor to install them. Tepui Tent installs are $150 and up depending if we need to do anything custom. Most Front bumpers are $500 install, some take longer, If we add a winch, its an extra $250.00 If we need to do custom relocation of the solinoid box, that is by the hourly rate. Tire Mounting and Balancing is $25 per Wheel and Tire.